The Sicilian "continent" is the result of the fusion of the African continental plate and the European one. The landscape spans from coastal plains to the hills and mountain regions, from vineyards at sea level to those that grow one thousand meters above sea level. Diverse soils, complex climates, with weather conditions that vary from moderately cold to subtropical. The land is the combination of environment, man and vineyard, and produces 70 different grape varieties. Since 1830, Tasca d'Almerita has been an expression of tradition and innovation in the wine industry, on the island of Sicily. They have studies each territory to discover the potential of each individual area. Today, it operates in five farms (Tenuta) boasting the most suitable lands for wine production in Sicily, five estates in five territories for a unique way to interpret wine, including Tenuta Tascante on Mt. Etna, Tenuta Whitaker on Mozia, Tenuta Capofaro on Salina, Sallier de La Tour in the Palermo province, and most famous, Tenuta Regaleali in the DOC Sclafani County. Tasca d'Almerita currently run by Count Lucio Tasca, along with his sons, Giuseppe, Vice President, and Alberto, CEO. Located on the northeastern coast of Sicily, Mt. Etna is the tallest and most active volcano in Europe. A fascinating land, particularly fertile thanks to the numerous lava flows. The Etna DOC consists of small areas called districts and it represents an important portion of the wine-growing industry in Sicily. The area is located within the Etna Park, a protected natural area, to be safeguarded as much as possible. Here, it is possible to ski while overlooking the sea, a unique and breathtaking view. For several years, Tasca d'Almerita has followed the development and climatic trends of the entire DOC Etna region, having made wine experimentally using many types of grapes from those regions. The name Tascante is the result of the combination of Tasca and Etna. The Tenuta Tascante project brings together two districts featuring 21 hectares located between the municipality of Castiglione and Randazzo. 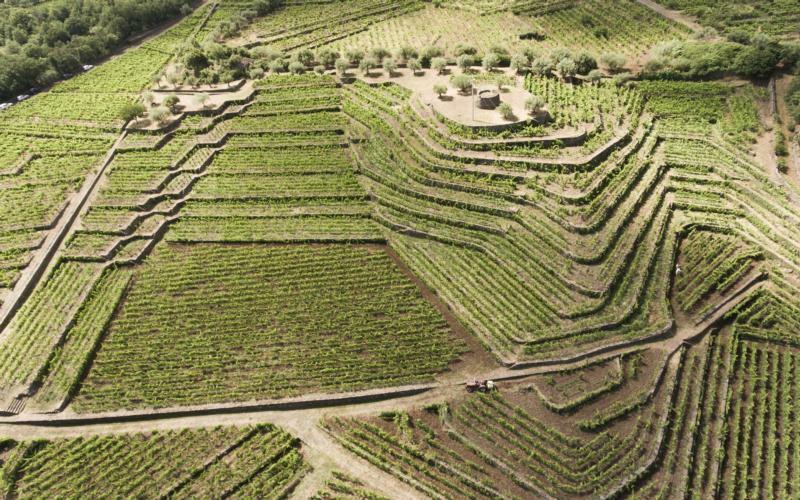 The Boccadorzo farm whose terraced vineyards remind one of an ancient Mayan structure and the 40 year old Sciaranova farm. 2008 was the year of our first harvest, from 12 hectares of vineyards, 750 meters above sea level. The grapes planted at the estate include the most notable, Nerello Mascalese, as well as a small quantity of the white, Carricante. 100% Nerello Mascalese from young vineyards at Piano Dario. Fermented in stainless steel, aged 12 months in 60 hl Slavonian oak barrels. Ghiaia Nera” translates to “Black Gravel” found throughout the area.